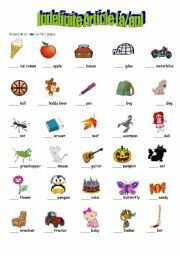 A very useful activities that cover Present Simple and Present Continuous. A wide range of exercises on these two tenses. Enjoy! This is a simple and very colourful exercise on articles, which can be used for instance as a warm-up with beginners. 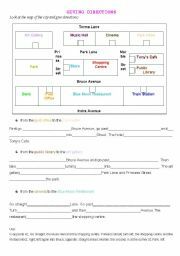 It�s a worksheet containing 4 different exercises on past tenses. It�s done in the form of test. Enjoy! It�s a nice exercise useful when giving directions or becoming oriented in city maps. 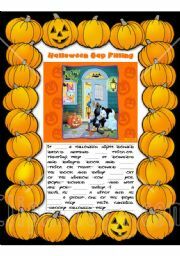 This worksheet is an open-cloze exercise in Halloween scenario. 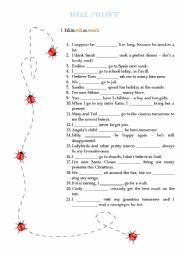 Students have to fill in the blanks with Past Simple mainly (sometimes Past Simple as well). The story is illustrated by the picture. Enjoy! 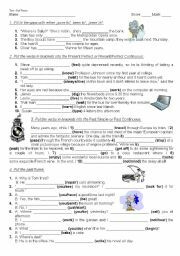 It�s a worksheet on some practical exercises on past tenses: past simple, past continuous, present perfect and present perfect continuous. It�s an intermediate level. Enjoy! Hi again! 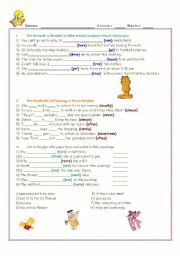 This time I prepared a relative clauses worksheet. It contains basic grammatical information, but also practical exercises of different sort. Enjoy! Hello everyone! 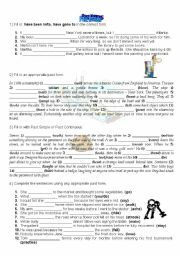 This time I�ve prepared a fairly easy worksheet dealing with "will" and "won�t". I�m sure your children will love the ladybirds :) Enjoy! Nice and useful activity to be used with people at the intermediate level. Reported speech and different vocabulary. Enjoy! This is a PowerPoint game on past forms. 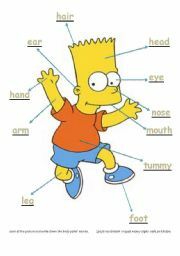 Both regular and irregular verbs are checked. Each fly is carrying a label with some forms of the verb in question. Click on the label with the correct form and the frog will catch the fly! Great fun! Enjoy! This is a PowerPoint game on modal verbs. You have to fill in the gaps in the sentences with a correct modal verb by clicking on the correct ball. If the word is correct the dolphin swims to the ball and starts to play with it. Have fun! This is a PowerPoint game on both irregular and regular plural forms. After clicking on the correct worm the fish swims towards it and eats it. Enjoy! This is a PowerPoint game on some and any. Students click on the correct answers that would fill in the sentences and the mouse (Diddl) eats the cheese. Enjoy! This is the second part of my PowerPoint game on Past Simple and Continuous. Students have to fill in the senstences and then the gun shoots into the target. I used unusual fonts, but hope your computers will read them well. Enjoy!